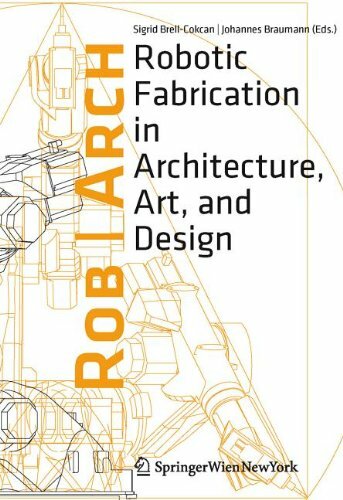 In December 2012, I participated to the first edition of the Rob|Arch symposium in Wien, organized by the Association for Robots in Architecture. This participation was divided into two events: workshops with robots, and a series of lectures. During my lecture, I presented the design strategy I used to build HAL 004 and the new development objectives relative to this software: improvements of the real-time control interface, support for multiple robot brands, support for external axis, etc. I also gave a quick demonstration of the TouchOSC-based HAL interface for iPad and iPhone. Pictures of the slide above are extracted from the symposium photo album: http://www.robarch2012.org/photos (by Raimund Krenmüller, Marko Tomcic, Eugen Popa). Below, the paper presented during this symposium. Thibault Schwartz, ‘HAL: Extension of a visual programming language to support teaching and research on robotics applied to construction’, Rob|Arch 2012: Robotic Fabrication in Architecture, Art and Design; (Wien: Springer, 2012), pp. 92‐101.